Home Off Beat	The Lacoste tattoo – Its all about being original! 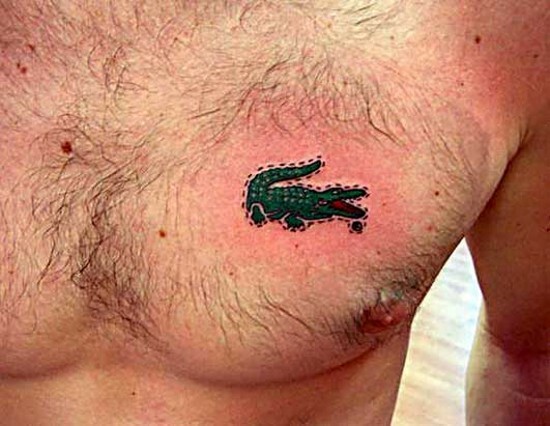 The Lacoste tattoo – Its all about being original! Either the man above is a shrewd penny-saver or he is just head over heels for this iconic Lacoste alligator. However, I think the latter reason suits him more aptly. I bet this guy wanted to confirm that nothing comes between his heart and this alligator, not even the famed Lacoste shirt! Though I’ve seen a whole lot of tattoos much weirder than the one featured above, I think no one beats this on the scale of originality. Its about inking your passion, its about being original to the core!